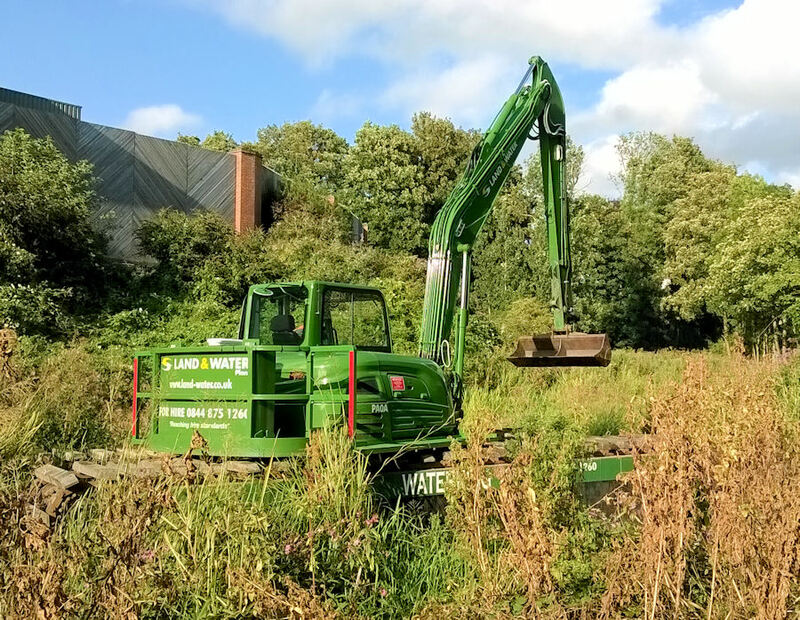 The arrival of the Land & Water Dredging Team at Lodgemore on Monday 11th August signalled the start of the second phase of canal restoration between Stroud Brewery Bridge and Lodgemore Mills. Chris spoke of the intense background work that has gone on well before the arrival of the diggers and dumpers. The initial stage involves ‘enabling work’. This term describes the creation of safe access for the heavy plant as well as assisting in the actual dredging and silt disposal. Some invasive species of vegetation will be dealt with. A fish rescue will be carried out this week to relocate fish back into the canal below Dudbridge. A silt curtain, a textile membrane, will be installed across the channel to prevent suspended silt solids from flowing into the restored canal. Overhanging trees will be dealt with. Heavier timber will create habitat piles on the bankside opposite the towpath. This is where most of the excavated material will be placed and landscaped. Chris explains the next stage with a degree of enthusiasm. “We will be excavating a navigable channel using some impressive equipment. “Land and Water have recently purchased two Waterking amphibious excavators. They are manufactured in the Netherlands where they know a bit about drainage management! It is an excavator mounted on a pair of floating caterpillar tracks driven on large flotation pontoons. Click here or on the Farsons Watercams image above to view the work in action. The picture refreshes every fifteen seconds. Although the canal restoration project is mainly funded by the Heritage Lottery Fund and Stroud District Council, the work at Wallbridge has been assisted by a generous £100,000 grant from the Veolia Environmental Trust. Ian Edwards, the council's Canal Manager, said "Technically, this is a very difficult site in which to work. Access is very difficult and would have been impossible without the kind assistance of landowners. When this work is complete, yet another length of derelict canal will have been returned to its former glory for everyone to enjoy." Dredging from Wallbridge Lower Lock to Lodgemore Bridge means the towpath will be closed from west of Stroud Brewery Bridge to Lodgemore Mill. Pedestrians should take the parallel route along Cainscross Road to Lodgemore Lane to regain the tow path at Lodgemore Bridge. Click here or on the map below to view a Google Map of the area. Click here or on the icon below to see a WK80 in action. It is little wonder the towpath has to be closed temporarily! Click here or on the other icon below to find out about Land & Water. Click here or on the icon below to find out more about the Veolia Environmental Trust. This entry was posted in Dredging, Latest News and tagged Latest News. Bookmark the permalink.